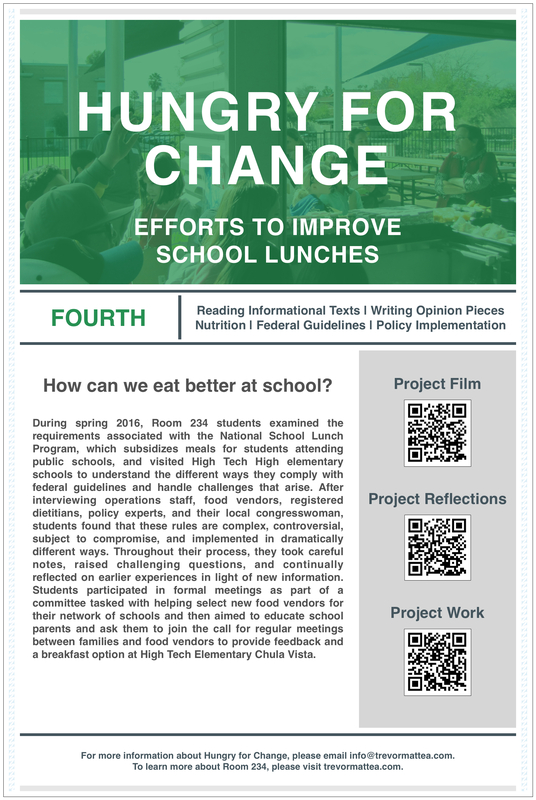 During spring 2016, Room 234 students examined the requirements associated with the National School Lunch Program, which subsidizes meals for students attending public schools, and visited High Tech High elementary schools to understand the different ways they comply with federal guidelines and handle challenges that arise. After interviewing operations staff, food vendors, registered dietitians, policy experts, and their local congresswoman, students found that these legal rules are complex, controversial, subject to compromise, and implemented in dramatically different ways. Throughout their process, they took careful notes, raised challenging questions, and continually reflected on earlier experiences in light of new information. Students participated in formal meetings as part of a committee tasked with helping select new food vendors for their network of schools, and then aimed to educate school parents and ask them to join the call for regular meetings between families and food vendors to provide feedback and a breakfast option for High Tech Elementary Chula Vista. This project was featured on EL Education's Models of Excellence.